At 4.15pm on 11th July 1995, General Mladić and the Serbian army entered Srebrenica to claim the town for Bosnian Serbs. Fifteen minutes later, with 5,000 refugees inside the enclave, Dutchbat troops claimed their base was full. As Mladić and his troops descended upon the town, 20,000 people sought refuge in nearby factories and fields to no avail. As night fell, Dutchbat troops began abandoning their posts, and it became clear to the refugees that no help was coming. Slowly, word began to spread. At midnight, 15,000 Bosniak men set off from Srebrenica, to assemble at Buljim Hill for the long walk to the free territory of Tuzla. As the men assembled in a column on the hill, Serbian Military forces began heavy gunfire. Unarmed and without shelter, the back of the column disintegrated as the men ran into the woods for cover. Hundreds were killed. Aware that thousands of men were now hiding in the woods and without any means of contacting each other, the Serbian Military used stolen UN equipment to pose as peacekeepers, and coax the men out from hiding. Those who took the bait were encouraged to call out to their relatives- their sons, brothers, and fathers to reveal themselves. Among them, were Ramo and Nermin Osmanović. Along with several others who surrendered, Ramo and Nermin were rounded up and executed. Meanwhile, the surviving men continued their efforts to reach Tuzla and to reassemble what was left of the column. On 13th July, the Serbian Military ambushed part of the column on Kamenica Hill. The back of the column was hit the worst; many were killed on the spot, hundreds of others were captured. Those surviving scattered into the surrounding forest once again. The Serbian Military resorted again to false promises of safety and aid. More than 1,000 were killed on this day. After two days of walking, part of the column reached the Konjevic Polje intersection: with one route leading to Bratunac, and the other to Tuzla. The few who had survived rested briefly here, and narrowly escaped discovery by a Serbian Military tank. From here, the men walked to Baljkovica Valley. It was here that Hasan Hasanović, a surviving member of the death march whose story can be read here, hid in a stream for two hours, whilst the few armed men of the column resisted another Serbian Military assault. As the valley cleared, the men made a dash for the free territory of Zvornik. They were welcomed by the townspeople of the Nezuk village, where busses and trucks arrived for the men to board. After five days, and six nights of walking, reporters described “an army of ghosts” arriving at Tuzla. An annual march, entitled the Mars Mira (The Peace March), is conducted every year to commemorate the brave men of The Death March. 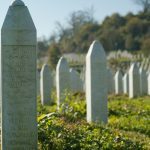 Upwards of 10,000 men left Srebrenica on that ill-fated night. A mere 3,000 survived.